Teal wall colour - What is the teal paint colour please. Hello, thank you for your question. This colour is by Dulux called Jimbaran Bay, code P32A7. Regards, Karen. 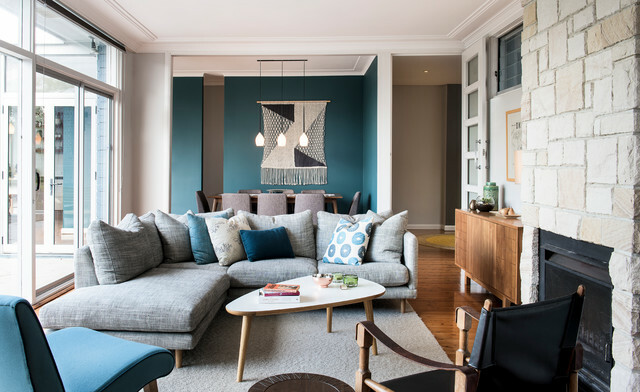 Color Scheme - I love this muted Aqua colour scheme. Where I buy the ornaments/ vases used in this scheme? Hello, thank you for the question. These items were purchased last year via a trade supplier to the interior design industry and unfortunately they no longer carry this line. I would suggest looking at retail suppliers such as West El,m, http://www.westelm.com.au/vases-botanicals-we-au and Orson and Blake, http://www.orsonandblake.com.au/2-2_online-store.htm Good Luck! Regards, Karen. Where are the lights from , please? Janet Dunn added this to Does Your Home Need a Colour Consultant?